K&N Intake Kit - Fuel Injection Performance Kits (FIPK) - Dezod Motorsports Inc - Home of the automotive performance enthusiast since 2002. K&N Fuel Injection Performance Kits (FIPK’s) are built for many different vehicles and represent a dramatic improvement over a K&N O/E replacement filter alone; they use only non-metallic rotationally molded tubes that can reduce air temperature and decrease intake sound over a metal tube. Restriction can exist BETWEEN an air filter and the engine reducing the benefit of a K&N Air Filter. The weakest link in the airflow “chain” robs a vehicle of its natural horsepower. Often that weak point is the factory air path leading to the Engine. K&N Fuel Injection Performance Kits (FIPK) virtually eliminate air path restriction by replacing the air filter and the entire air path to the engine. The aerodynamically engineered tube drives a massive amount of air into an engine, which translates into POWER. K&N Fuel Injection Performance Kits (FIPK) are truly state-of-the-art. K&N starts with the largest conical shaped high-flow air filter that can fit into the engine compartment while using factory holes and mounting points. 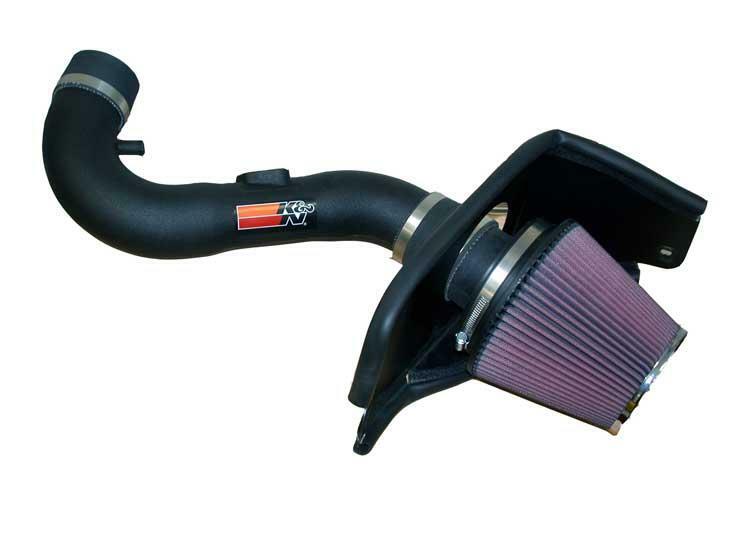 This extra filter size provides even more airflow at lower restriction than a standard K&N O/E replacement filter that is limited to the size of the factory air box. The oversized air filter also captures and holds more dirt increasing the service life before a cleaning is required (up to 100,000 miles). When possible, the filter is isolated from high engine temperature by a heat shield designed to lower the temperature of the air entering the engine, which increases horsepower. Next the filter is attached to a rotationally molded tube made from interlaced High Density Polyethylene (HDPE). This process allows the tube to be precisely shaped to reduce turbulence and accelerate airflow into the engine. This is why some tubes have unique shapes that are specifically engineered for each application. Finally the tube is connected to the engine with adapters made from high strength materials such as silicon and reinforced nylon and ensures long life. Put all this together and you have the best high-flow intake system available today.